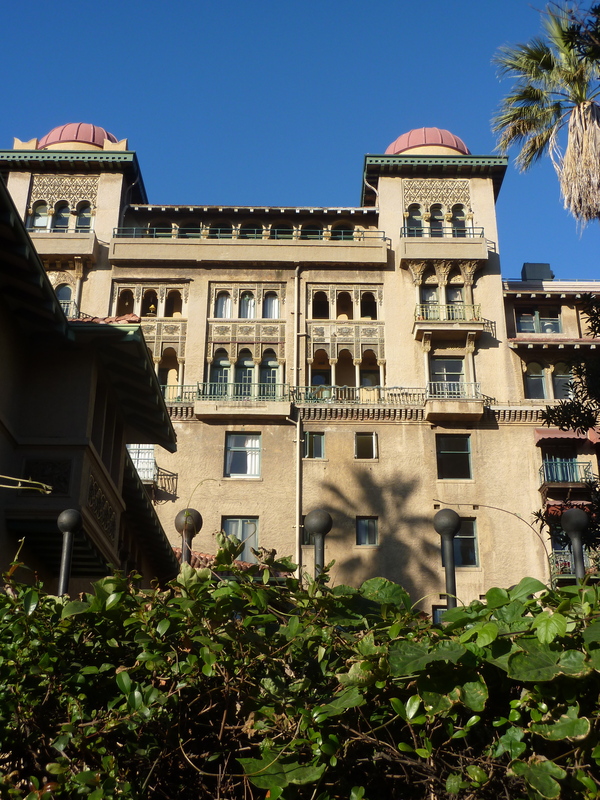 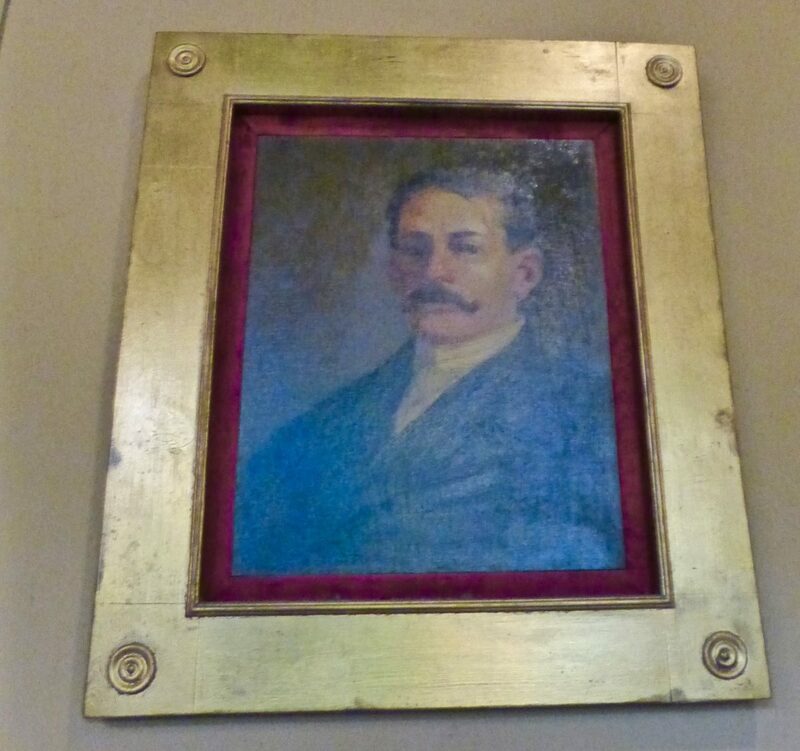 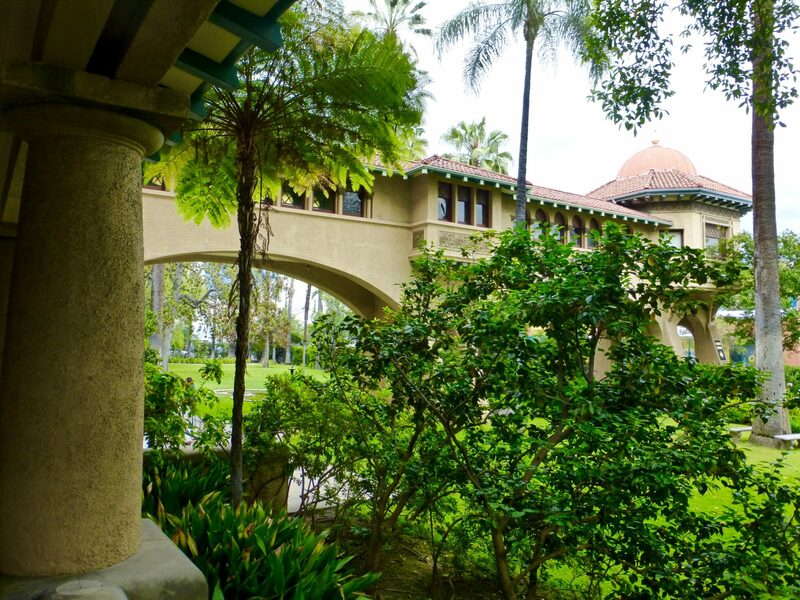 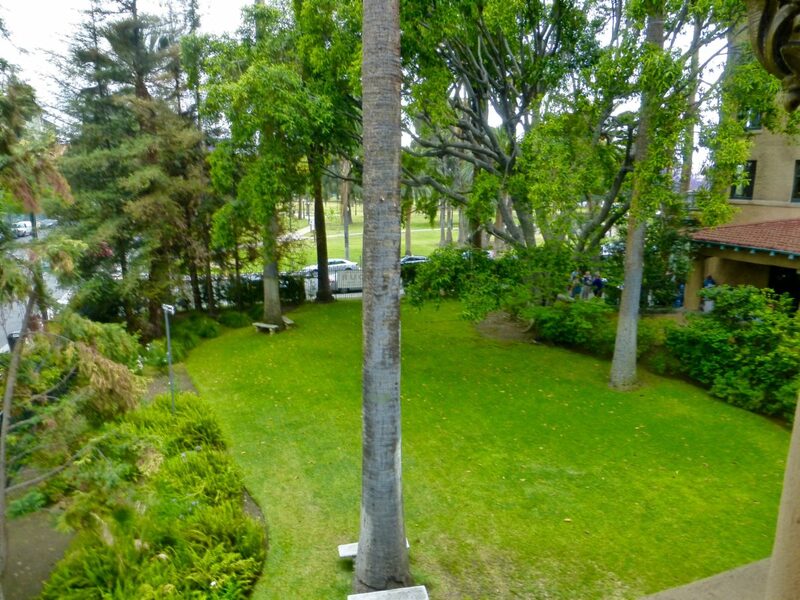 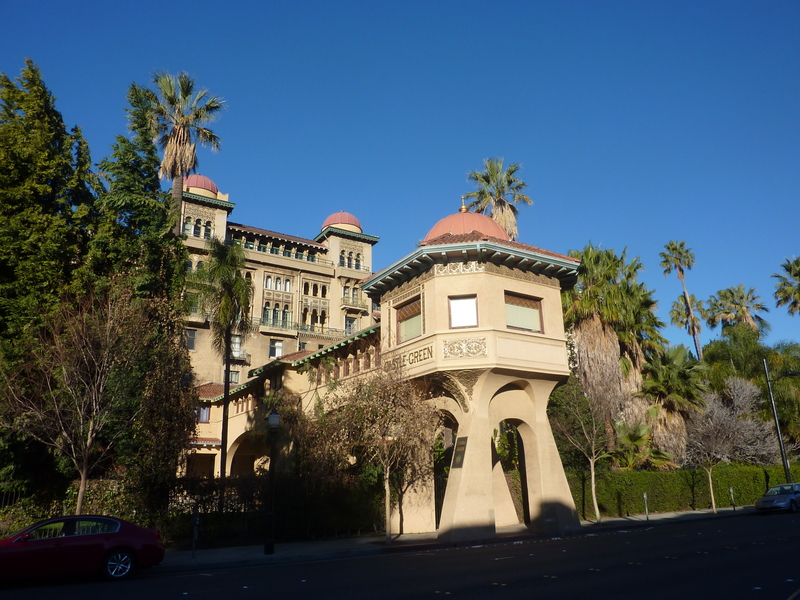 Going back a few years, a businessman by the name of Edward Webster had built a hotel here near the Intercontinental Santa Fe railroad line, ostensibly to have folks from the east coast and Midwest come to Pasadena to escape those brutal winters. 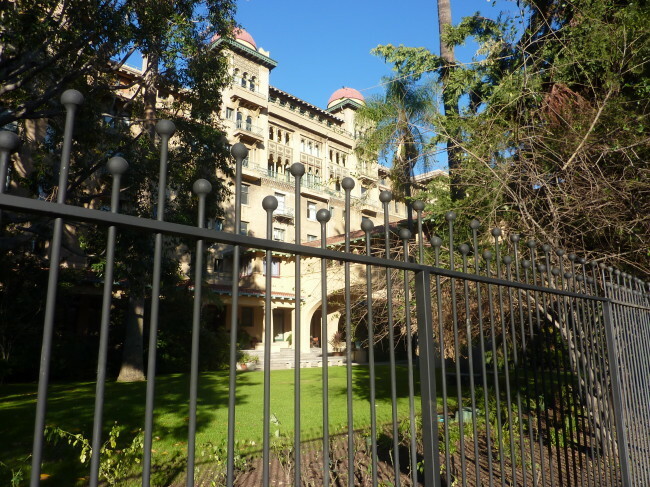 Colonel Green helped finance that hotel. 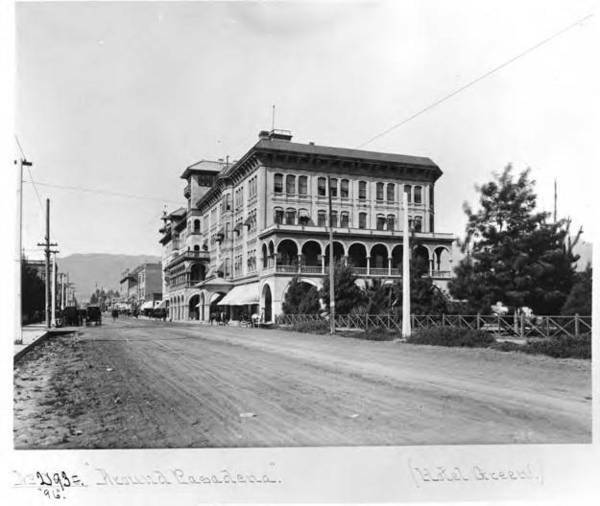 Webster went belly-up, so Green became the owner of the hotel (Hotel Green photo below from Pasadena Library circa 1896). 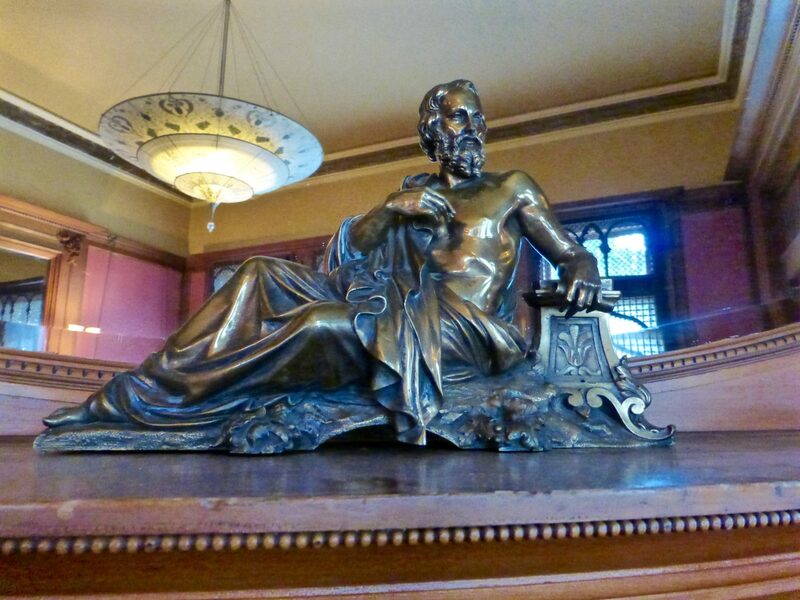 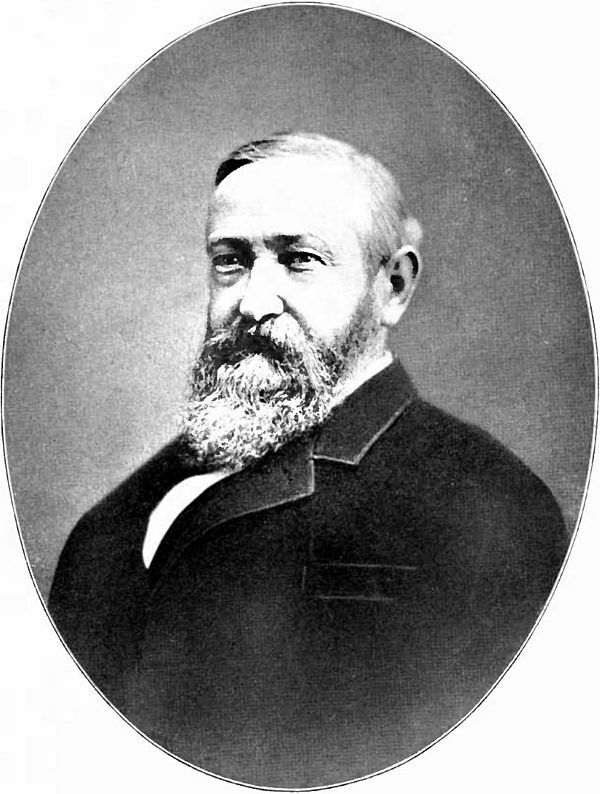 One of the old hotel’s famous guests was president Benjamin Harrison. 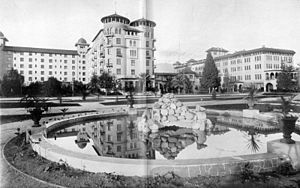 After completion of the annex of the Hotel Green, the hotel now had 550 sleeping rooms and 375 baths. 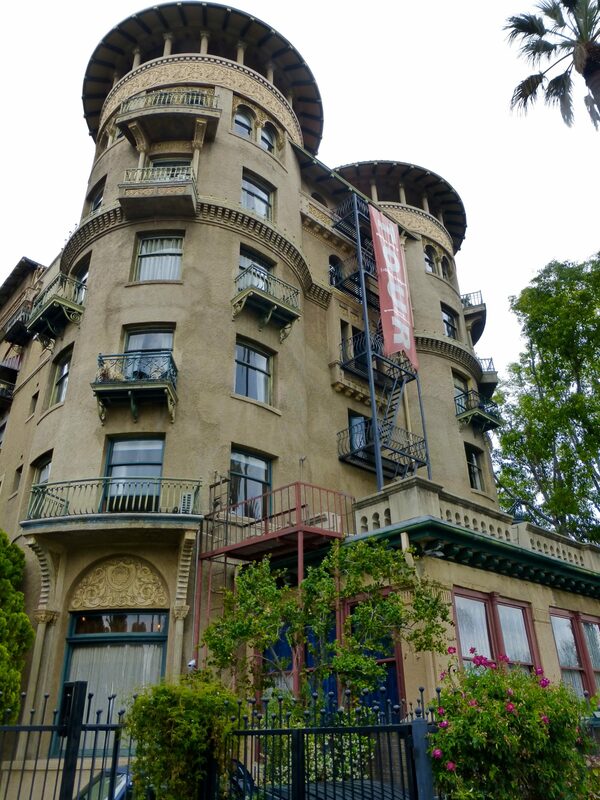 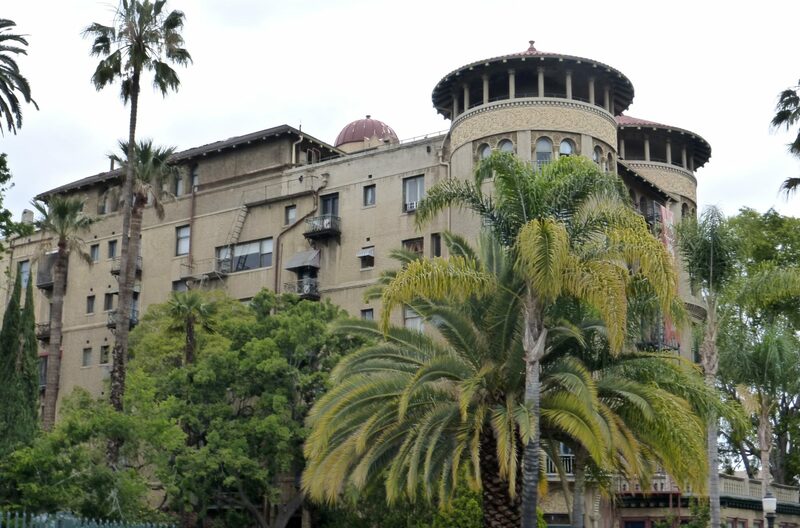 The Castle Green has been turned into condos, but it is one of the oldest standing historic landmarks in Los Angeles County. 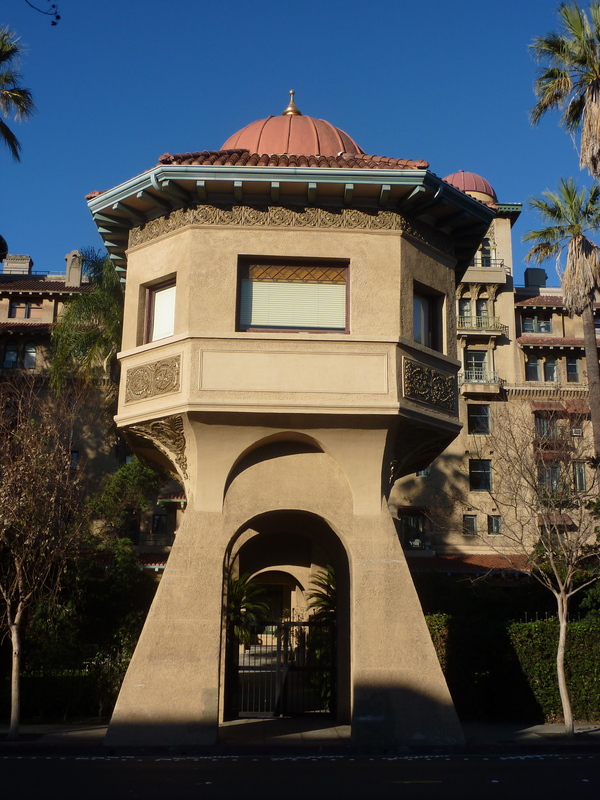 It still retains many of its original features from its construction including the oldest wrought iron elevator on the west coast. 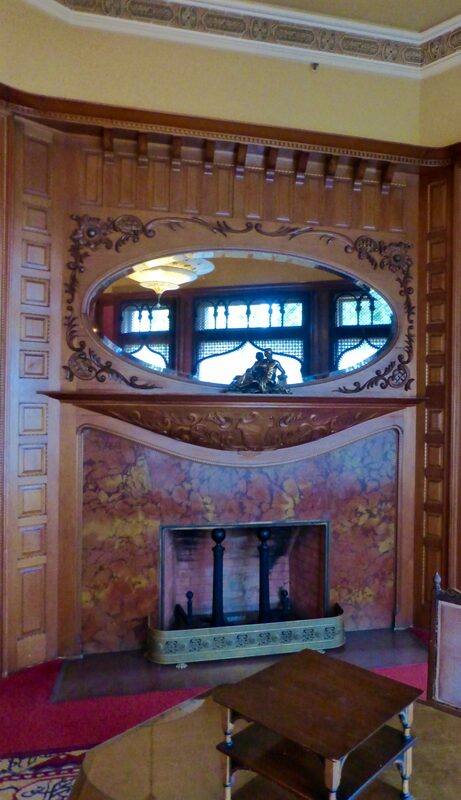 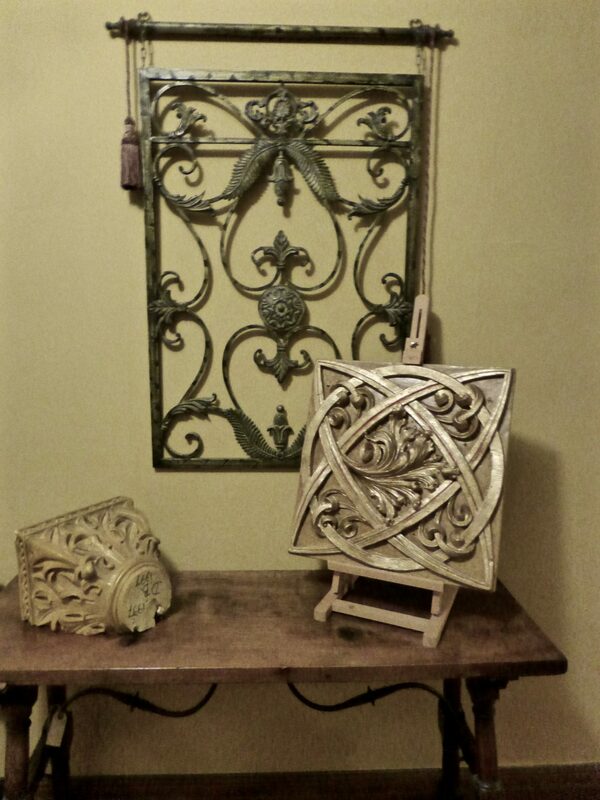 Castle Green also features beautiful moldings, hand carved fireplace mantles, and original lighting. 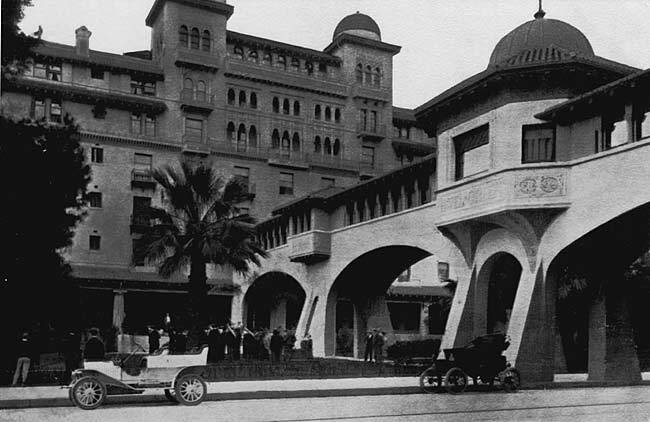 The east side of the building and the bridge are sadly long gone (there was a Stats holiday store there for many years, but it recently went out of business). 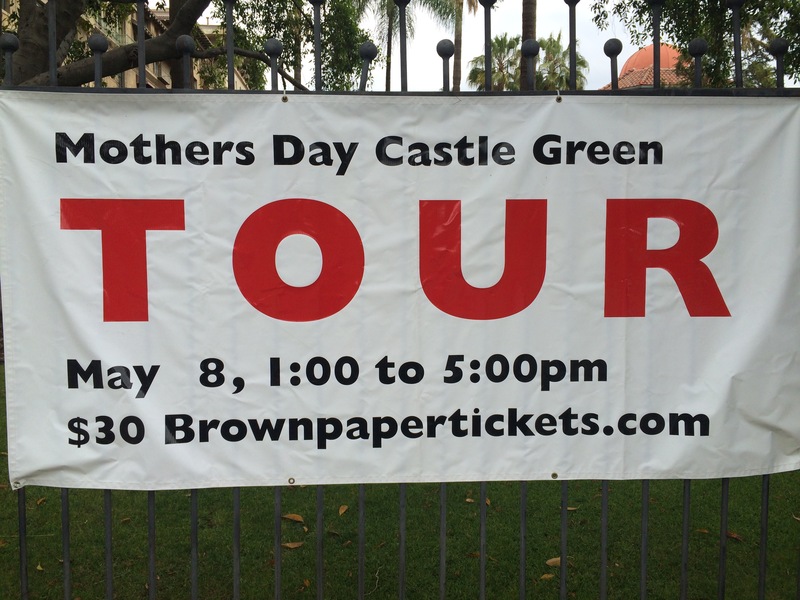 Still a lovely oasis in Pasadena, the Castle Green does have a couple of open houses during the year (Spring, Mother’s Day and Christmas time) when regular folks like us can catch a glimpse of old Pasadena history. 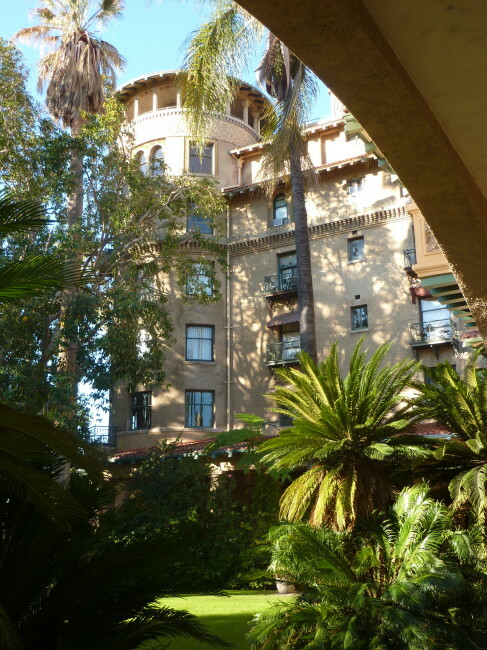 As you can see, the property is very photogenic, especially on a beautiful, sunny morning (well aren’t they all beautiful in Pasadena) when I took all these photos. 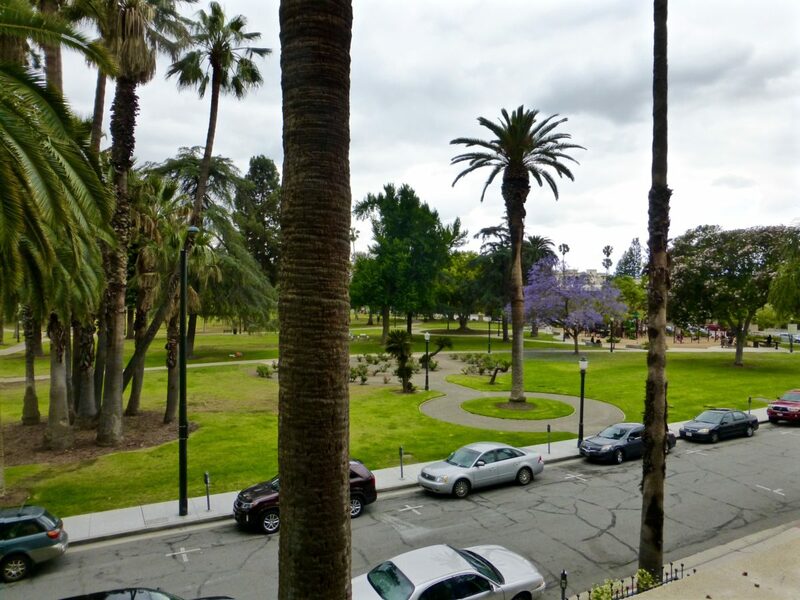 OK, I lied above…not all days in Pasadena are sunny. 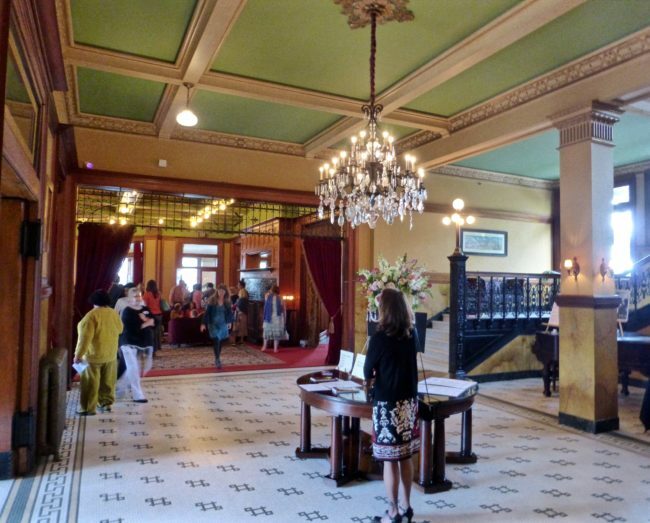 However, that did not deter me (along with hundreds of others) from visiting on Mother’s Day to check out the interior of this historic building. I parked on nearby Fair Oaks and approached the Castle Green from the rear. 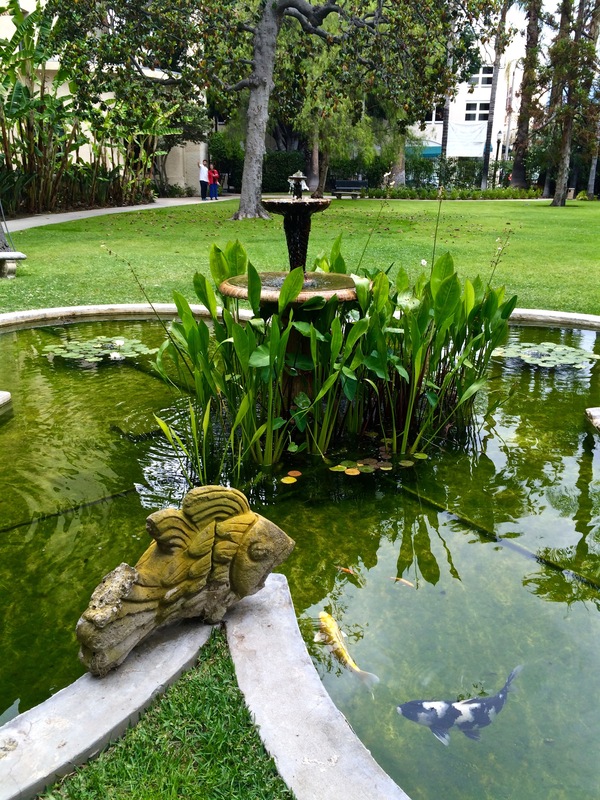 Walking inside the gates, I was in the stunningly beautiful garden, complete with a koi pond (lots of koi ponds in this town…so many that I have run out of puns). before entering the Main Entry (aka Lobby). The floor is a white and green mosaic tile, and the chandelier isn’t too shabby either. There is a portrait of Colonel Green in the room. Next stop on the self-guided tour was the Grand Salon. 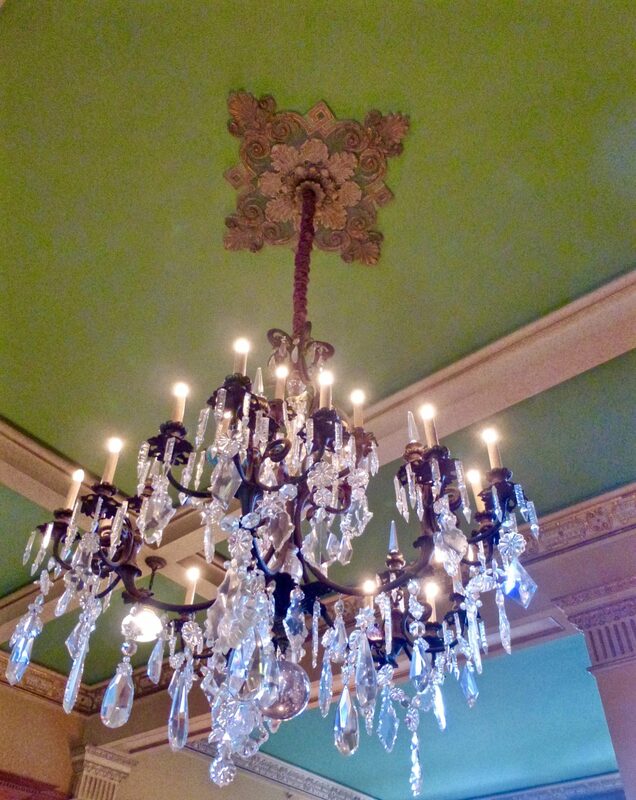 The ceiling contains beams decorated in various colors. The highlight of this room was the baronial fireplace, which was “surrounded by green-glazed tiles surmounted with a mantle shelf placed at an exaggerated height. 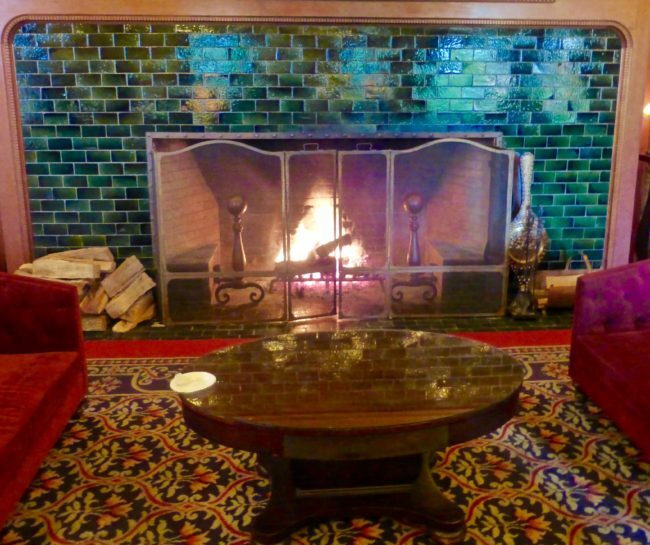 The mirror above was set within a paneled over-mantle of Port Orford cedar.” It was my favorite mantle I had seen since Mickey. 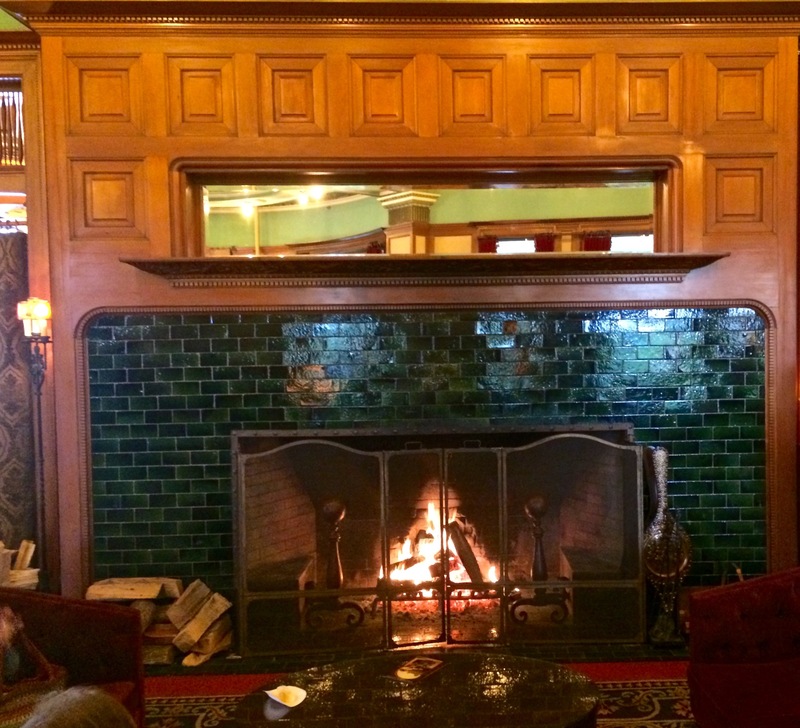 The fire added a nice touch on this overcast day. 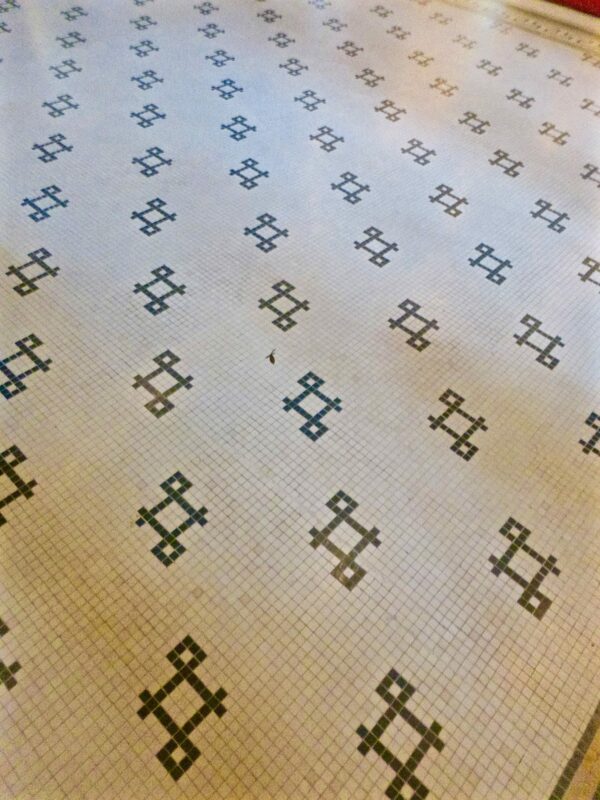 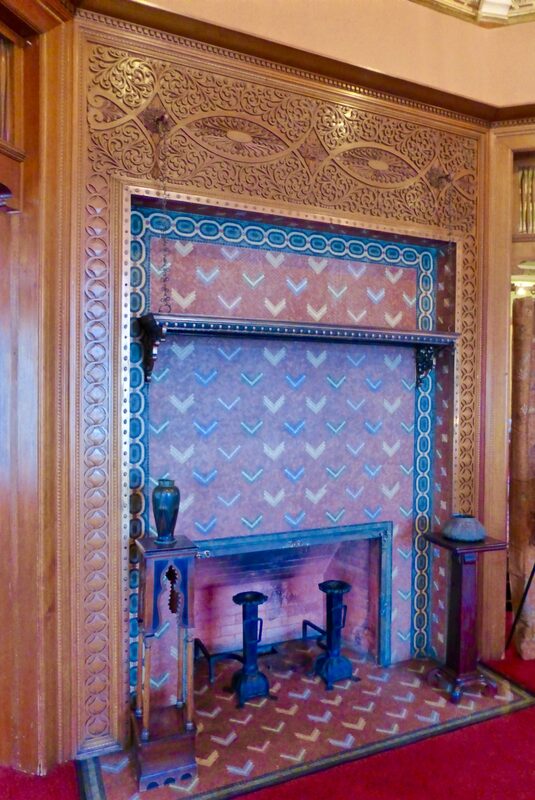 The information stated that the mosaic-tiled fireplace had chevron patterns, yet there was no gas pump in sight. 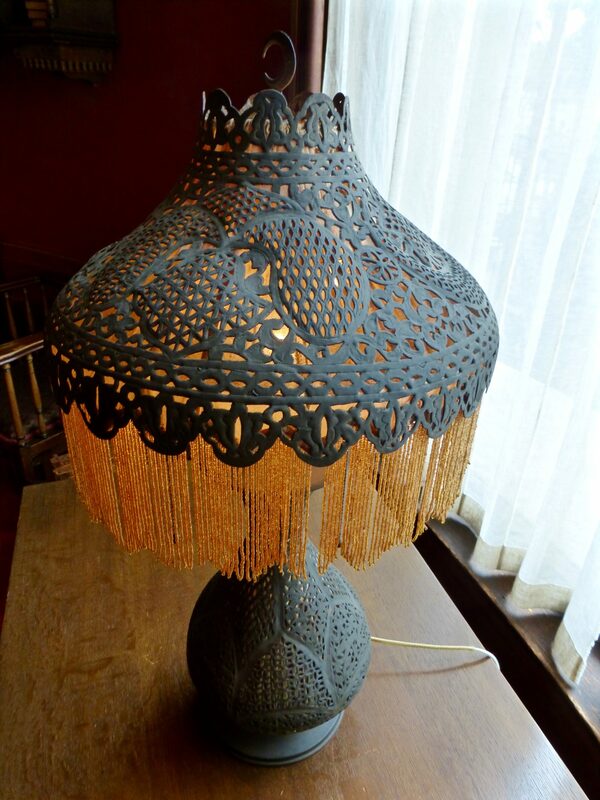 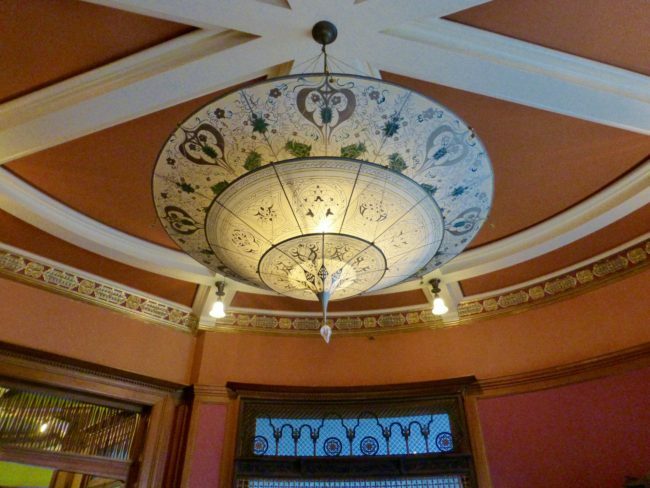 …not including a hand-decorated, silk Fortuny lampshade at the ceiling, which was donated by one one of the Castle Green’s residents. 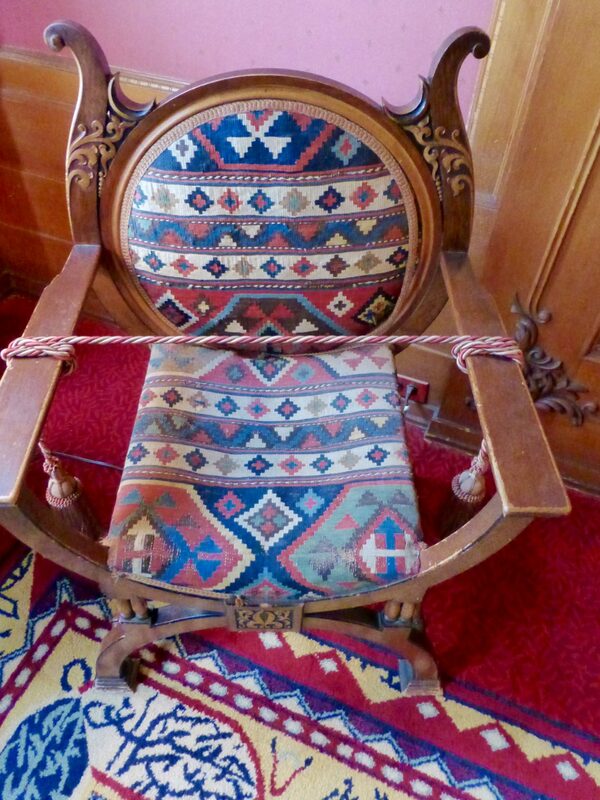 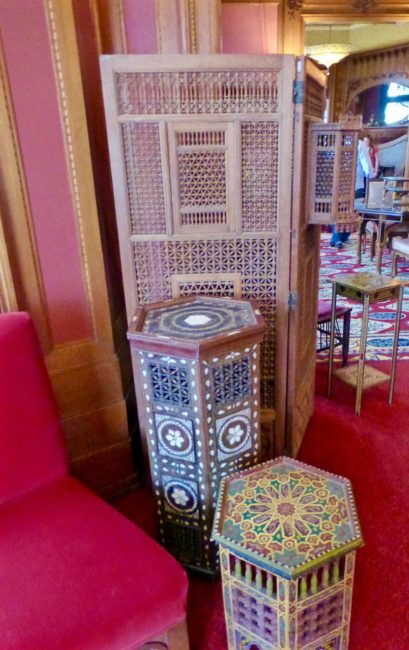 The Turkish Room also contains mostly original furniture pieces, like this colorful chair. 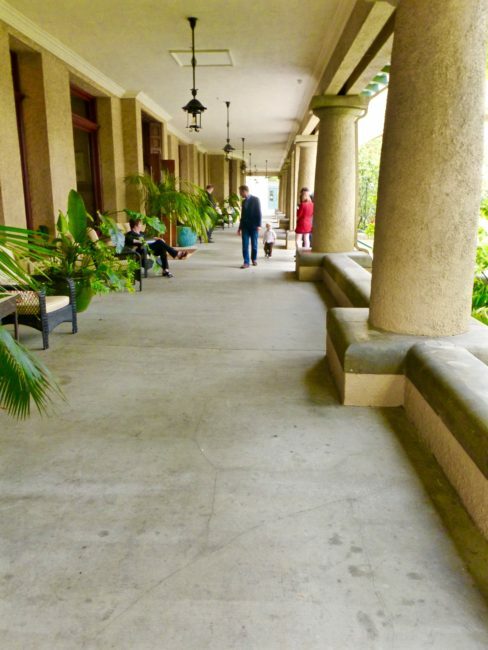 I walked back through the lobby to the Palm Room, which was not part of the original construction of the hotel. 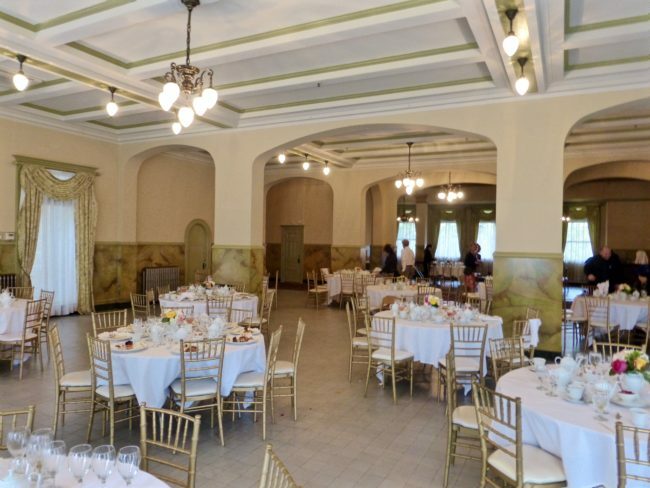 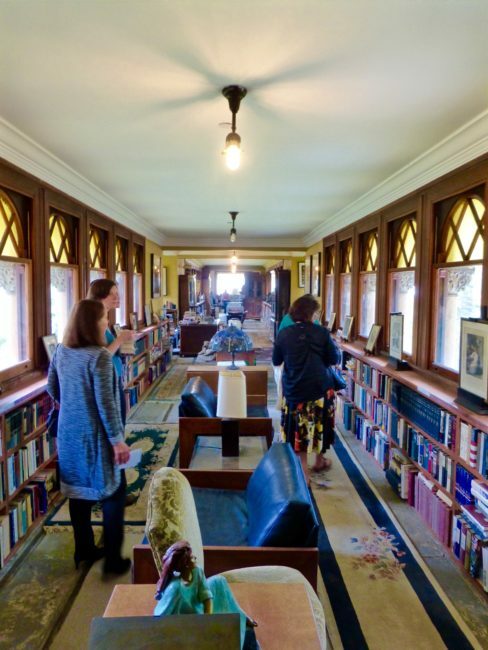 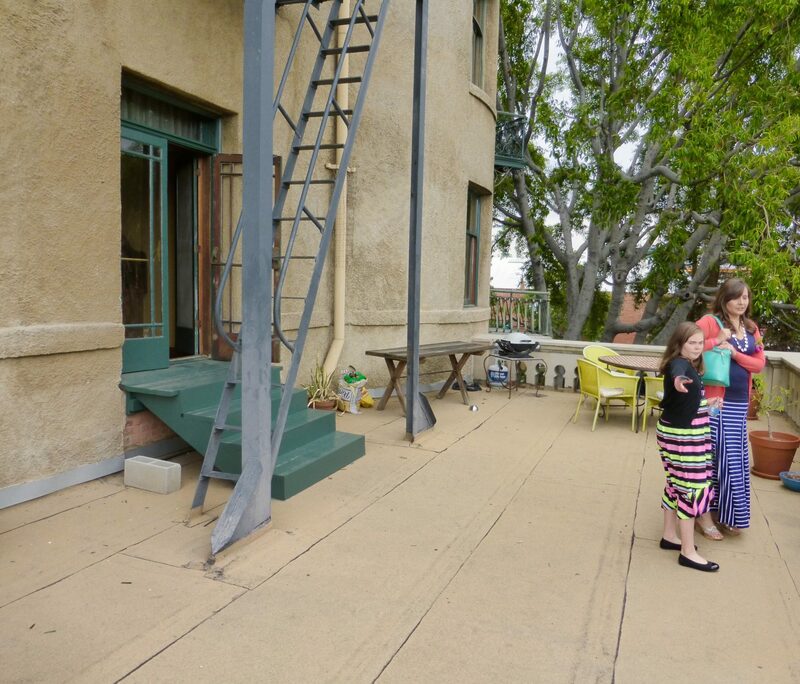 It was created in the early 1900s and is utilized now for dances, weddings, dinners, and other events…like the Mother’s Day Tea that was held earlier in the day. 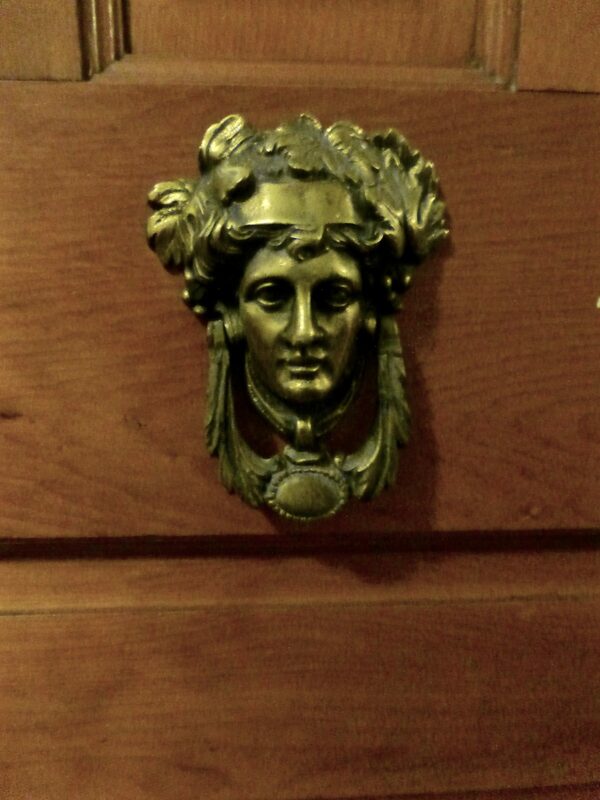 By the time I got there, not even a leftover croissant could be found. 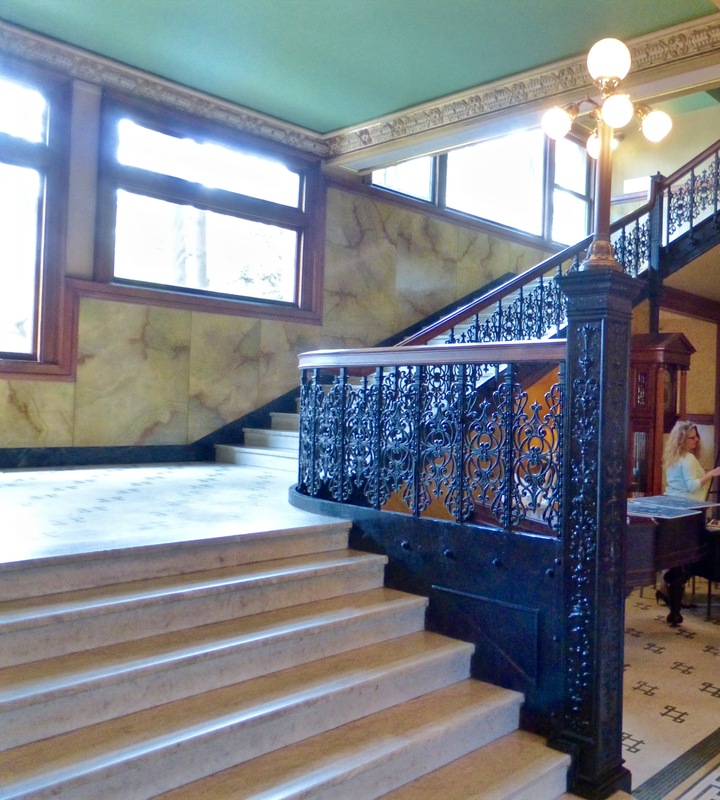 Back in the lobby, I ascended the ornate, wrought iron staircase of Carrera marble. Upstairs, I took a quick photo of the open-cage elevator, one of the few that still survive in Southern California. Obviously, the elevator market has had its ups and downs. 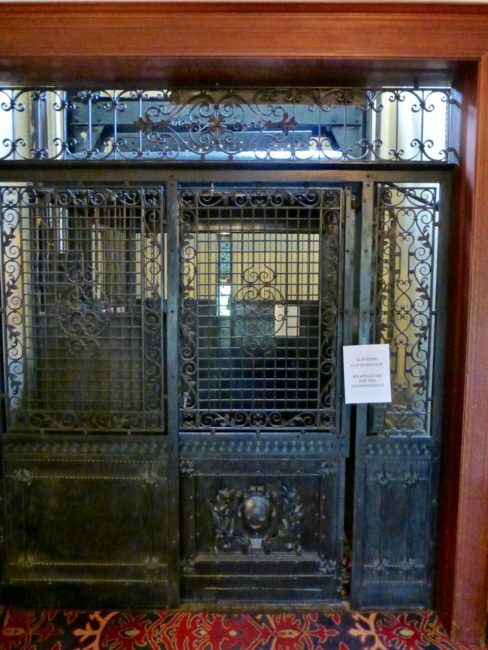 The elevator was not in working order, which helped me since I had just started my seventh diet of the new year. 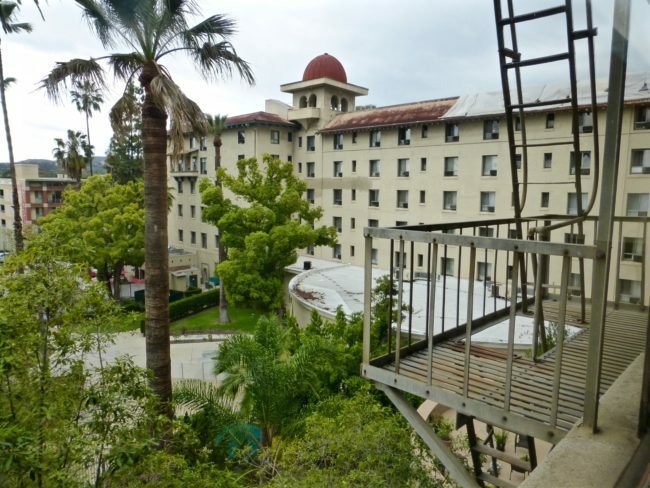 I entered the old pedestrian bridge that used to span Raymond Avenue (200 feet in length at the time) connecting the two wings of the hotel. 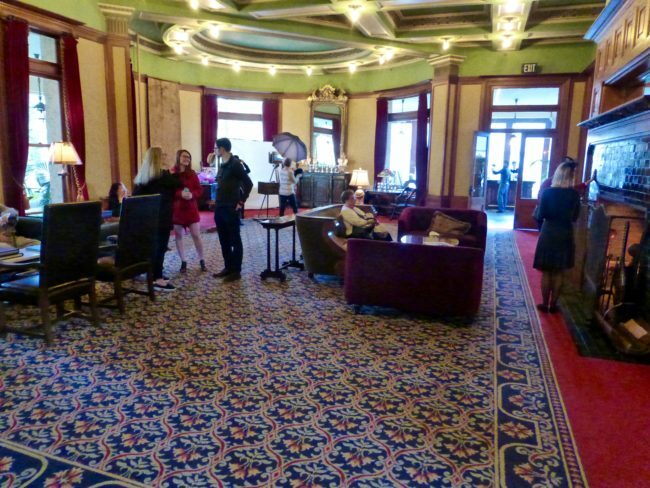 Inside the “bridge area” now was a place where you could buy souvenirs. I spied an old phone. 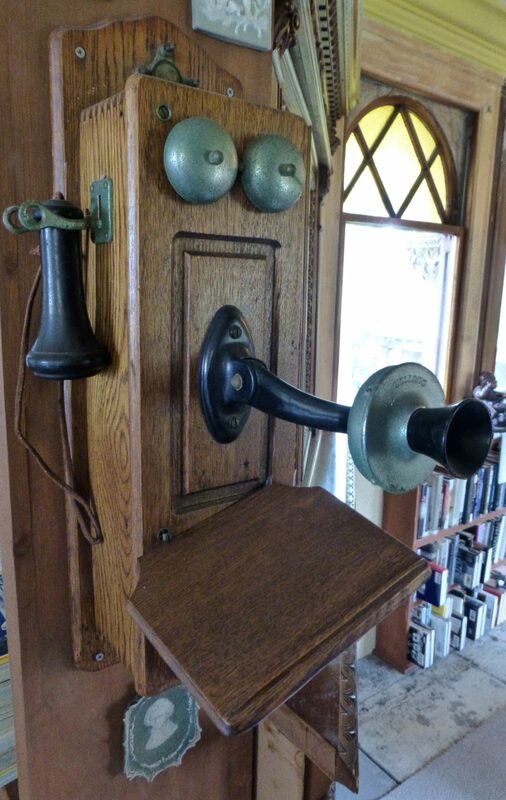 I wondered how they charged it. 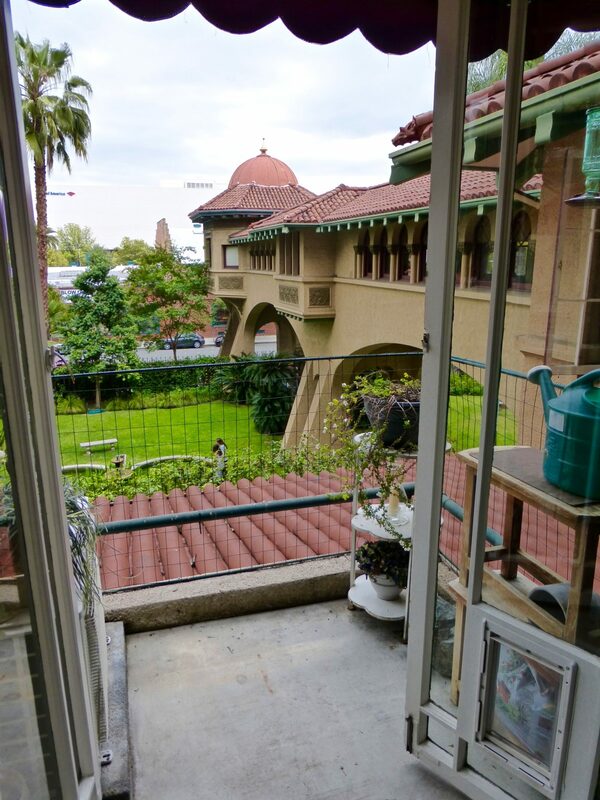 There was a beautiful view onto the interior front garden from the interior of the bridge. had a little better view than this one in the rear, but all the rooms were very interesting to tour (respecting the owners’ privacy, I took no photo). Speaking of views, from an outside patio, there was a nice view of the nearby Central Park. 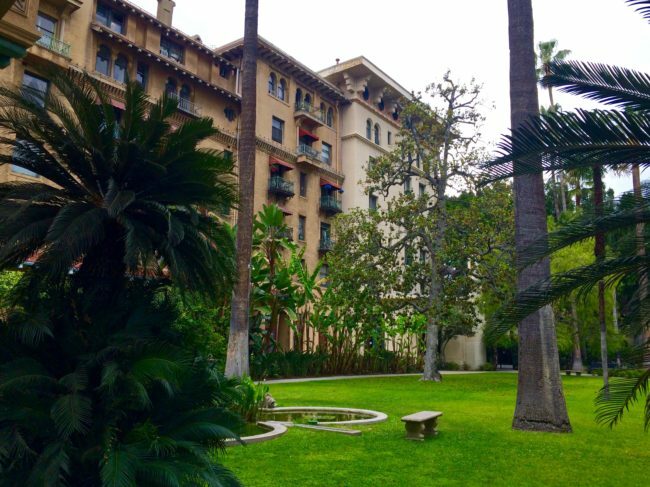 …before taking a walk around the interior garden one last time. 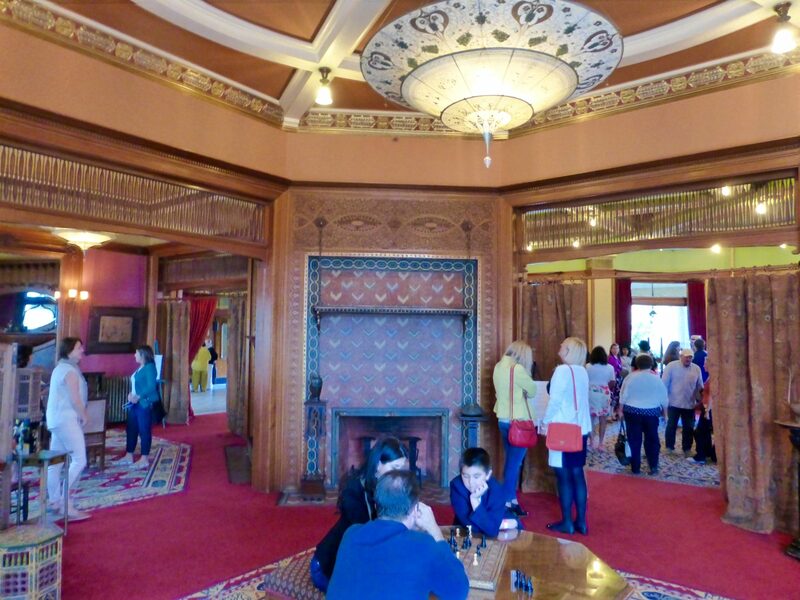 The next tour of the Castle Green takes place in December for the Holiday Tour. 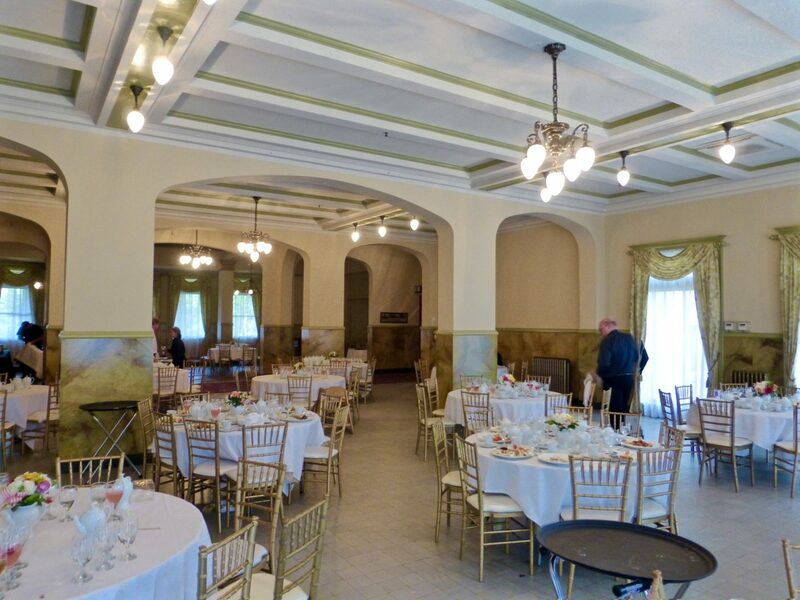 Mark your calendars for Sunday, December 4. 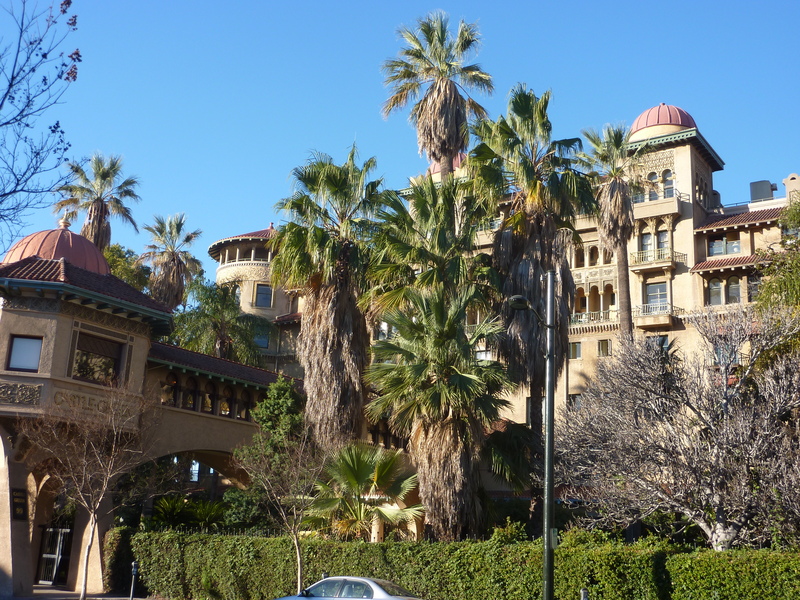 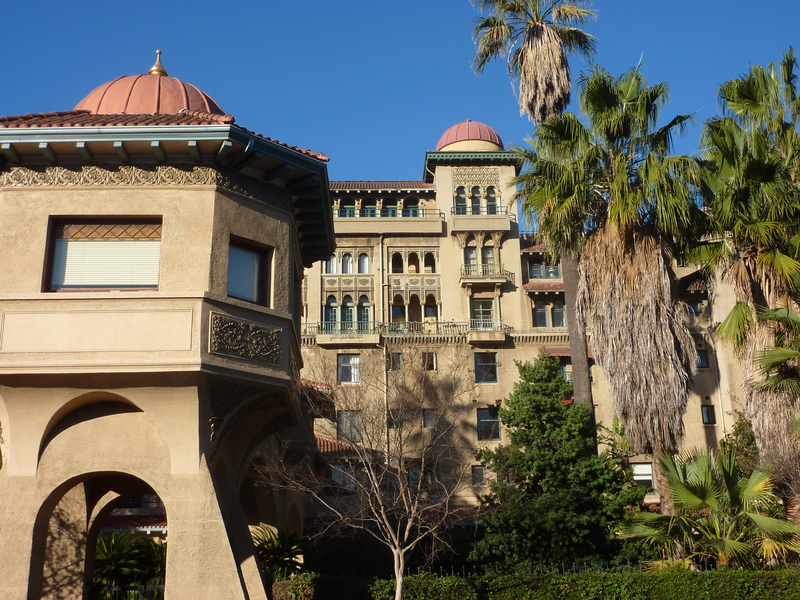 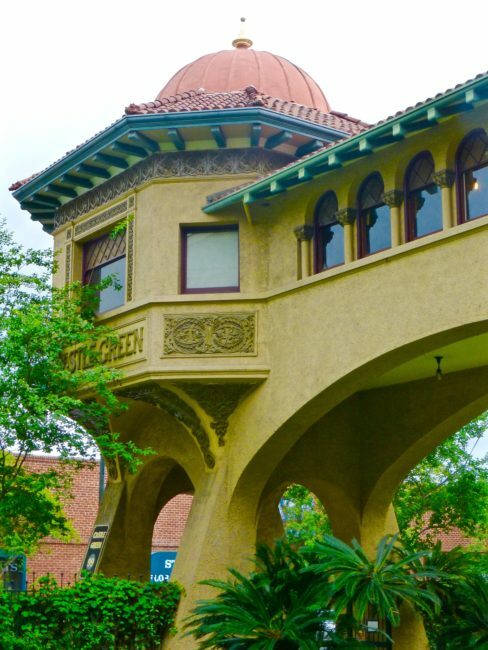 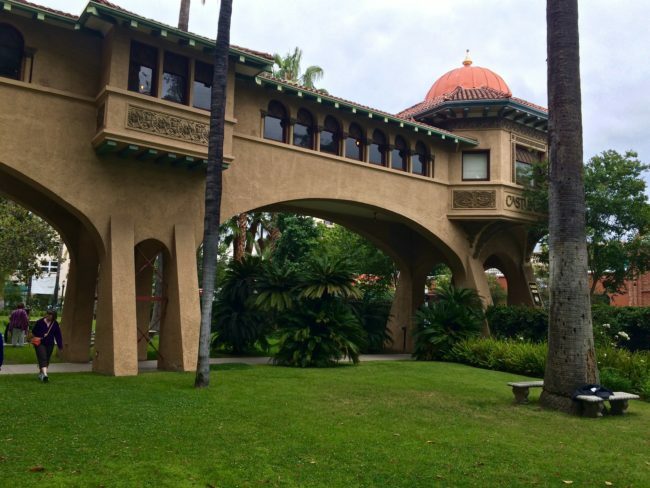 I think you’ll have a great time visiting one of Pasadena’s most historic buildings. 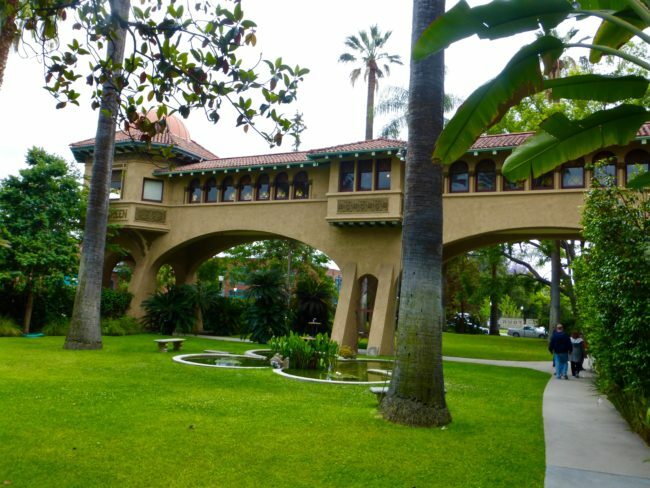 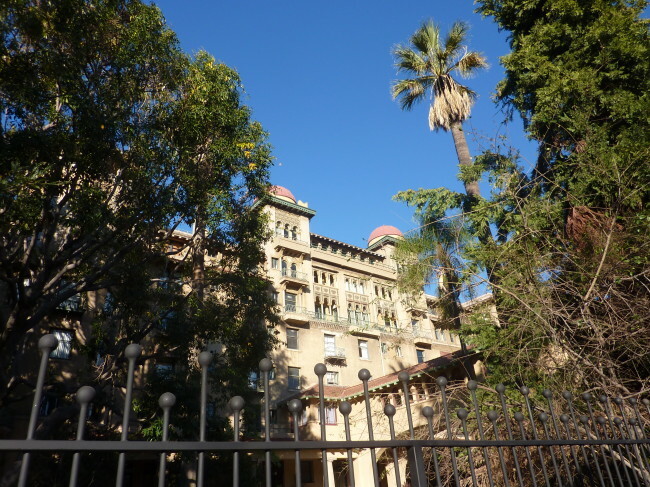 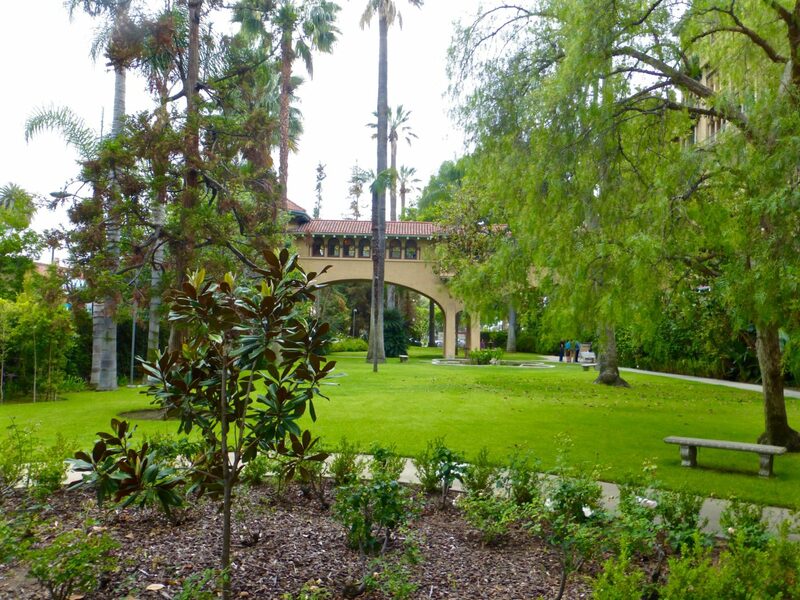 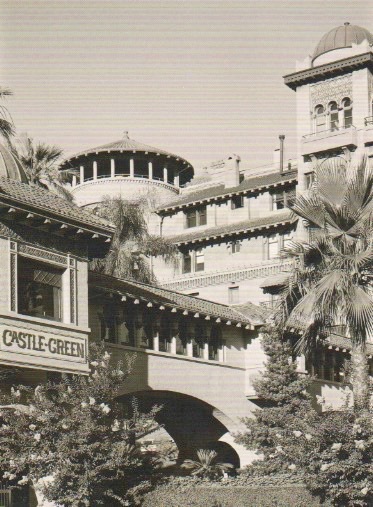 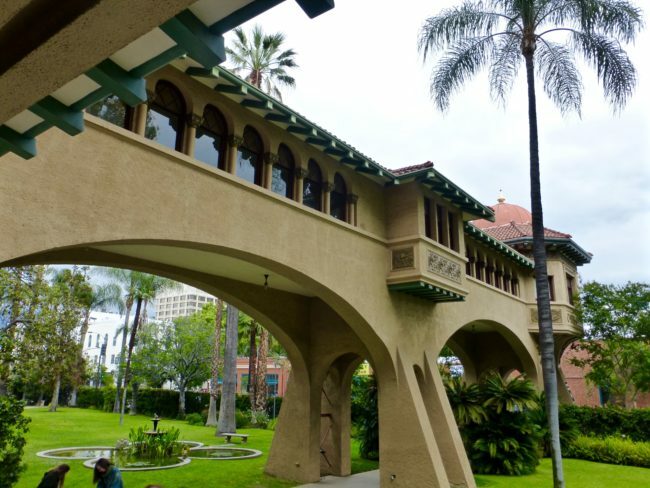 The Castle Green is listed on the National Register of Historic Places, the State Historic Register and the City of Pasadena’s list of Historic Places. 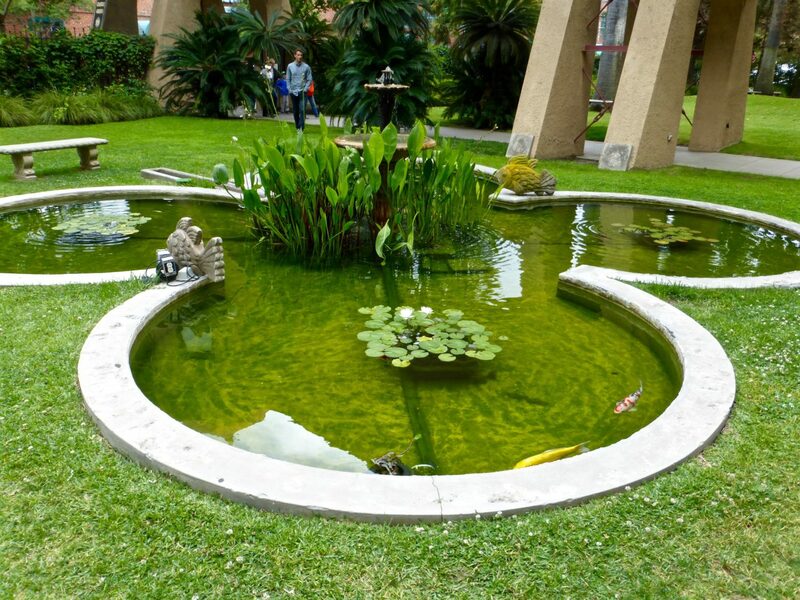 The gardens and portions of its interior can even be rented out for weddings and parties.